1966-67 Topps Hockey marked the third straight year the checklist grew, bringing it to the 132-card standard that it would keep for several years. The cards are oriented horizontally and mimicked a new development to American living rooms: the color TV. Card fronts have a player picture superimposed in front of a backdrop of a game crowd. They are framed by a picture tube, complete with an inset. The player's name, team and position appear below the picture, inside the wood-grain border that made it look like a console TV set. The TV design is on the back as well, with all of the info placed inside a black area. The player's name, team and position appear at the top. A puck-shaped icon at the upper left contains a card number, with a short biography beside it in English. Stats from the previous season appear below that, with the first instance of vital statistics found in a Topps hockey set. At the bottom, a French translation of the biographical paragraph appears. All six of the teams in the NHL are included in 1966-67 Topps Hockey, with each team getting two series within the set. There are team cards for the Montreal Canadiens and Detroit Red Wings, the Stanley Cup finalist. The set also has two checklist cards. Four cards feature head coaches. The final 12 cards of the set feature the First- and Second-Team All-Stars. While the 1966-67 Topps Hockey cards feature bilingual backs, there are some that can be found with English-only backs. Those cards are actually from a test set issued only in the United States on a very limited basis. They are rare and quite valuable. 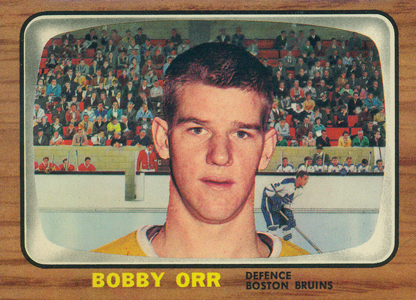 The key card in the set is the rookie card of Bobby Orr, one of the iconic cards of the hockey collecting hobby. Other notable rookies are Emile Francis, Harry Sinden and Peter Mahovlich.